After Kim Jong-il died on Dec. 17, 2011, North Korea held large-scale gatherings on the first, second, third and fifth anniversaries to pay tribute to the late leader. Even after the death of the country’s founder Kim Il-sung, the North held large commemorative gatherings only on the first three anniversaries, and then the fifth, 10th, 15th and 20th anniversaries. South Korea’s Unification Ministry spokesman Baik Tae-hyun told reporters on Monday that as in the case of Kim Il-sung’s death, the North was holding large commemorative gatherings in that sequence for Kim Jong-il. 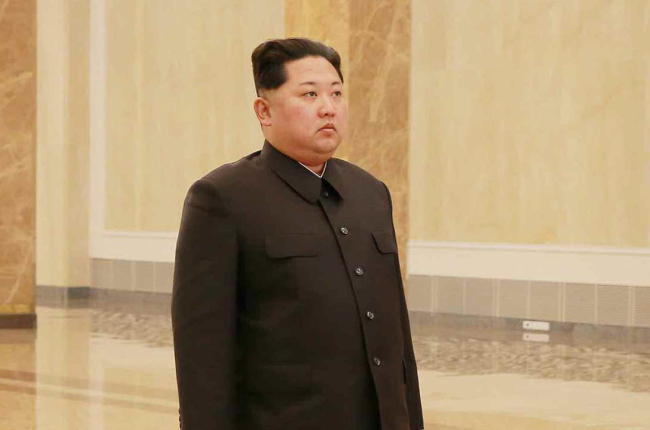 North Korean leader Kim Jong-un visited a Pyongyang mausoleum called the Kumsusan Palace of the Sun to pay tribute to his late father on Sunday, the North’s state media reported on Monday. The bodies of Kim Jong-il and his father Kim Il-sung are laid in state in the mausoleum. The state-run Korean Central News Agency and Rodong Shinmun, a newspaper published by the ruling Workers’ Party of Korea, released one photo of Kim paying tribute and another showing a basket of flowers laid in front of the statues of Kim Jong-il and Kim Il-sung.